» Cell tower: How tall is too tall? Cell tower: How tall is too tall? The pole would rise somewhere to the right of the rear of the bowling alley in the background. Verizon wants to build a cell tower in southwest Albany, and it needs a conditional use permit to do so. 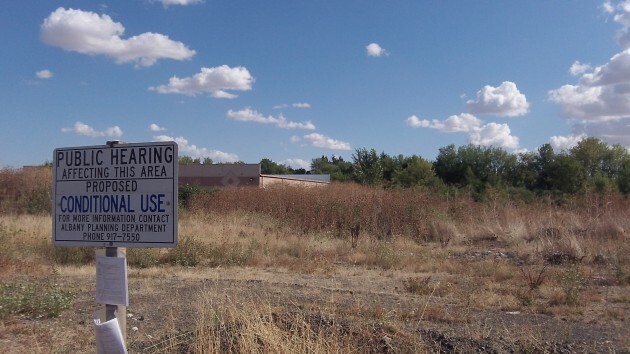 The city planning commission has turned the company down, and the company appealed. Now it’s up to the city council, which will hold a public hearing when it meets at 7:15 p.m. Wednesday, Aug. 27. The question is whether there’s anything wrong with a single tower, a monopole, that would reach 120 feet into the sky behind the the Lakeshore Lanes bowling alley. Verizon says it needs a tower in that vicinity in order to improve phone coverage between Albany and Tangent, and the vacant property near Pacific Boulevard and 53rd Avenue S.W., owned by Jerry Schneider of Schneider Homes of Tukwila, Wash., is the only possible place because other owners in the neighborhood have turned it down. The planning commission said that may be so, but the zoning is mixed-use commercial and the structure’s height is way out of proportion to what else might some day be built there. 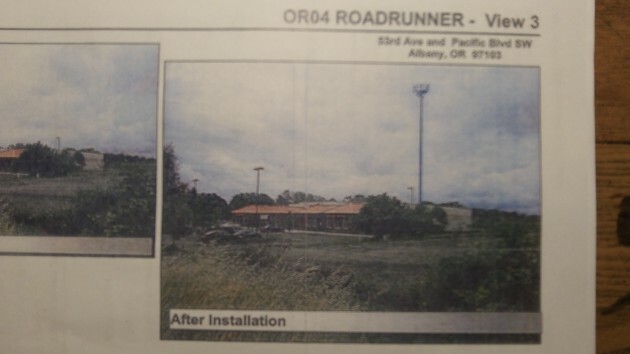 Verizon calls this project “OR04 Roadrunner.” The application for the Roadrunner conditional use permit includes some mock-up photos of what the pole would look like in the landscape behind the bowling alley. As you might guess, it sticks up 100 feet above the 20-foot-high building. Cell towers may be a blight on the landscape, but now they are everywhere. Do we still notice them or pay them any particular attention? It’s hard to make the argument that only because of its height, this tower is any worse than or different from cell towers in general. Well no, actually it’s easy to make the argument but hard to make it believable enough so that it sticks. Note to Verizon: Fly a giant U.S. flag on the pole and American bosoms will swell with pride. How tall is too tall? In this case, 120 feet is too tall. The proposed tower is in a mixed use zone. The way I read the federal law, if they allow it here they will have to allow 120 foot cell towers in every mixed use zone in town including downtown. That, in my view would be bad public policy when there is an ample supply of industrial zoned properties to place such a tower. In a Albany currently, about 90% of the cell towers are in industrial zones. The only two which are located in a mixed use zone is the one on the roof of the Daniels law office across from the D-H offices, you barely notice it, and one about 40 feet tall on the south side of the old Prarie Market building at Queen and Geary. It is proposed to be only 40 feet from the bowling center building. The city requires these poles to be at least as far from a public road as they are tall. This rule is in place to protect the public in the event of something catastrophic happening. It stands to reason that city policy should have the same protections in place for a building that the public gathers in. Lastly, it is not uncommon for ice to fall from the top of these poles in inclement weather. While a youtube search and viewing of such incidents is entertaining, the issue is a serious safety concern both to people and nearby structures that can not be mitigated. Living back of 53rd and up against the trees our coverage is horrible… I’m like a bad version of the “can you hear me now” commercials as I walk around my house searching for a signal… And judging by the comments on our HOA page, I’m not the only one. While I agree it’s not “pretty”, I pay for cell service that I would like to consistently receive, not to mention it’s far smaller than the GIANT radio tower we have back here so I see no problem but only benefits, and agree that with time no one will even notice it!